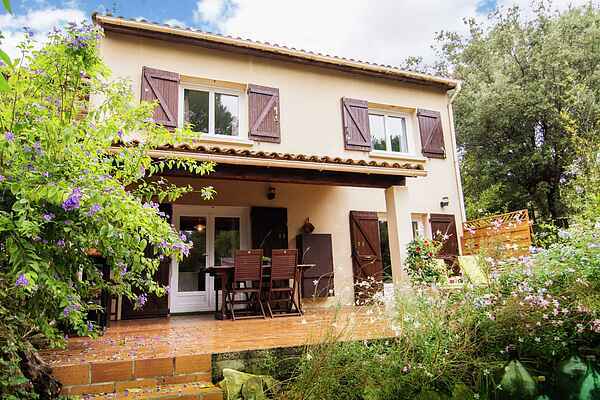 Lovely holiday home with a patio and a garden, on the edge of the village of Aubais (700 m) in South France, close to the beautiful cities of Nîmes (30 km) and Montpellier (32 km) and at the foot of the Camargue. You're less than half an hour from the white sandy beaches of the Mediterranean Sea at La Grande Motte (27 km). The surroundings make for wonderful walks and bike rides with breaks at idyllic spots along the river (3 km). There's a snack cart and a canoe rental place during the summer season. For cultural excursions, visit beautiful Medieval towns like Aigues-Mortes (26 km), Uzès (48 km) and Arles (55 km). Another must-see is the Camargue, famous for its white horses. Go horseback riding through the nature reserve with a private guide. Even if you've never ridden a horse before, give it a try. It's definitely worth it. You may set out to go on a quiet beach holiday and still find yourself short on time! In Aubais you can find a bakery, a grocery store and a bank. There are supermarkets and restaurants in Sommières and/or Lunel (about 9 km).